My hands are sweating. As I walk inside narrow metal hallways, I notice that I'm hearing things that, frankly, I'm not even sure are actually there. Hollow screeches. Faraway wails. It reminds me of seeing a shadow in the corner of your eyes, a darkness your sight never catches up with but that you're still convinced is present, waiting. Something has happened here. I don't know what, exactly—all I see are the ruins of a once-bustling industrial facility. The diligent machinery and assembly lines whir and absent-mindedly try to complete useless tasks, monitors flicker on and off in the distance, cables swing and spark in silence. The facility carries the eeriness of an uninhabited place that keeps running with a complete disregard of human presence—I'm not sure if the horror lies in the obvious tragedy that has struck and may eventually affect me in some way, or if the horror lies in the casual reminder that the universe doesn't even care about what has happened here. Maybe a little of both. Last month I got the chance to try out SOMA, the upcoming sci-fi horror game for PC and PS4 being developed by Frictional Games, the folks behind Amnesia: The Dark Descent. You play as Simon, a character that has somehow ended up in a strange situation. I don't know the specifics beyond that, as the particulars of the situation were kept a secret. Frictional didn't want to spoil things for me. What I can tell you is that, despite playing for about an hour, I didn't see an actual enemy or threat until the very end of the demo—the game burns slowly, wants to get under your skin before it gets your blood pumping. Most of the time, you can quickly tell how to get to the next area despite lacking a mini-map or a quest marker, and the puzzles I experienced were all rather simple. Grab a thing in one room and place it inside another thing in the room. Press some buttons and nobs. Read a post-it note. You won't want to blaze through to the next area, though. Or perhaps it's more accurate to say you can't. You might come across a dead body that's obviously hanged itself, or you might find yourself interacting with a machine that's weeping because it can't see, because it feels scared. The machine may not be alive, not in the same sense we are, but it's still afraid of dying. Like I said, the entire thing is a little unsettling. Part of you might feel like you want to get the hell out of there and back to safety, and part of you can't help but take a closer look. Curiosity is a dangerous thing indeed. "The thing that we're looking for is to really get into your mind in a different way," Thomas Grip, co-founder of Frictional Games, told me. "It's not just a theme park ride where monsters pop up and so forth, but we're sort of wanting to plant a few ideas as you go along…this [part of the demo] is sort of the start, where we plant a few seeds." As I played, I learned about a device that humans implanted in their brains, appropriately called black boxes, which can somehow be used to regulate people's emotions from afar. 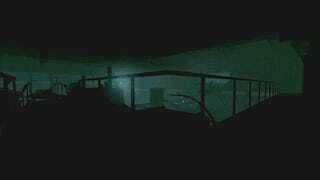 Black boxes also allowed me to find corpses and learn about their last living moments—which is probably the most novel take on audio logs in a video game that I've ever heard. The black boxes allow the player to start putting a story together as they play, a story which is never outright spelled out for you. Grip firmly believes there is power in choosing to not spoon-feed the story to players, as most games tend to do. "We're relying a lot on the player putting the pieces together, everything in that level has a coherent story structure," Grip explained. "You found the man that had died, the corpse, and the woman that hung herself. That's all connected." Here's what I pieced together. As I played I learned that many of the deaths seemed to be connected to a computer AI system gone rogue. And the promotional material almost made it seem as if the game takes place in space or on a near-future Earth—because that's usually where a lot of sci-fi takes place. That's not actually the case. "The world itself is a bit more complicated [than in previous games]. The whole underwater thing…most of the game is underwater," Grip said. "Normally you see space, and that's sci-fi, but we have this deep, mysterious water—the ocean is not really explored, and it's different, everything looks different." About half of what I played was underwater—first in the ocean, and then in sunken remains of a ship. 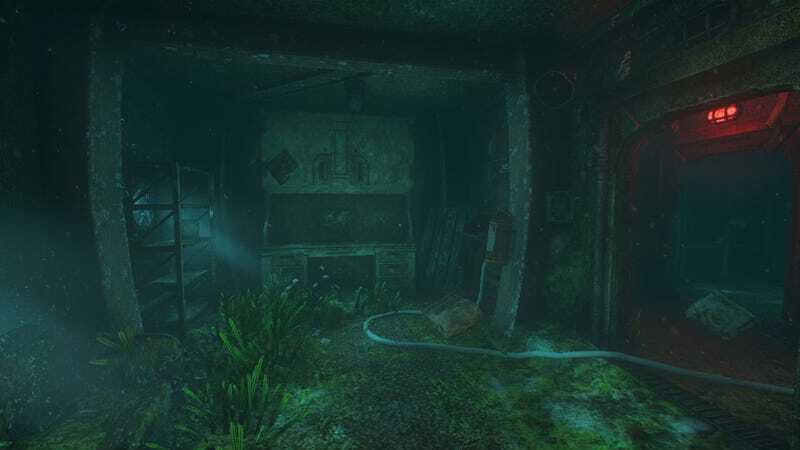 Being underwater made for an interesting contrast to the initial claustrophobic industrial setting, and it also acted as a good reminder that we don't actually have to get lost in alien worlds to experience strange, unknown horrors. Anyone with a cursory knowledge of ocean life knows that the deeper down we go, the darker it gets, and the more horrifying the creatures can become. But even if you're not diving deep into the ocean, you'll still experience all sorts of unfamiliar wildlife in a setting that is incredibly hostile to humans. The sea, though underexplored in most games as a horror setting, is just naturally terrifying—BioShock knew this, and SOMA is here to take that even further. "There's tons of wildlife, there's crabs, there's sharks—we've especially built it so they react, [crabs] hide from you and they dig under the sand, there's tons to explore [in the environment]," Grip told me. Curiously, open water felt just as tense and frightening as the denser, more compact facility you start out in—though for entirely different reasons. Being underwater means things will rust and become overrun with moss and seaweed, which add to the sense that you're an intruder. I also noticed without knowing where to go—again, some parts of the game are in the open ocean—I found myself silently panicking about where to go next. That seems intentional, though. Either the game was messing with me, or I couldn't hold it together enough to get my bearings. Thankfully, I was never lost for too long—just long enough that the game kept me on my toes. And then there's the Jiangshi, a dangerous type of creature I only caught a glimpse at the end of the demo when I was playing in the underwater section. Those of you who have played Amnesia might not be surprised to hear that you can't actually fight back in combat—you're expected to move around them or hide. After I scrambled all over the sunken ship, the Jiangshi managed to corner me. I could hear my heart racing as it crept closer and closer—there was nothing I could do but await my demise. That's when the demo ended. You might also be interested in knowing that, mythologically, Jiangshi are Chinese reanimated corpses, like vampires or zombies—I don't know if Frictional will riff off that idea much, since the creature looked sort of like a weird and upsetting take on a diving suit, but it seems worth mentioning. Intense stuff—and this is that I never actually discovered what in the world was going on, story-wise. Don't worry, though. Grip told me that once players get their hands on it, it won't take long for them to put the pieces together. It'll be a bit of a wait, though—currently the game is scheduled to come out in 2015. "You can figure out the mystery from the very beginning. All the clues are there, but the idea is that it's going to be hard for players to accept." Whatever the mystery ends up being, it's gonna be disturbing. I can't wait.